When I lost my job as a financial adviser, I felt it was the end of my career. Where was I to go from there, I wondered? I didn’t know. A lack of inspiration at home led to a feast of inspiration in the mountains. 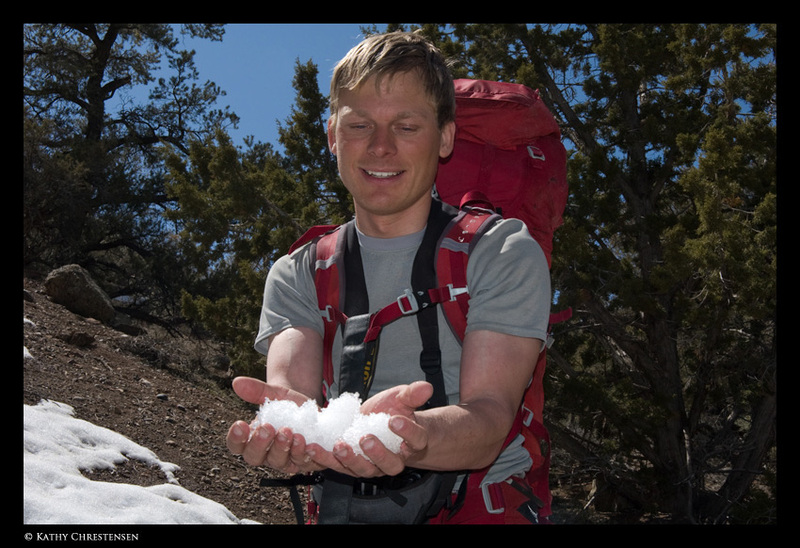 With well-meaning friends to my rescue, I took up my camera and began hiking, biking, skiing, and climbing. I realized new directions fuel change. Between a year of worrying and drifting between responsibility and adventure, my path has become clearer to me. But any confusion or upheavals are merely bumps in the road, not a precipice at all. You see, the future passes like the wind; you only have to keep your fates pointed just right, so as your sails fill up with air and propel you toward destiny. On April 9th, 2 days into my journey, I was in Death Valley National Park in Southern California under a sea of stars. It had been, to the day, exactly one year since I had last worked. While slaving away in the office all those years, the days too similar perhaps, my eyes would drift from that paper-filled desk in front of me to those clear office windows. Through them, I’d see shimmering slopes of mountain peering back at me. It was the ultimate Chinese torture I’d thought. In school I imagined different for myself, but there I was - the same. Something had gone wrong and I knew it. 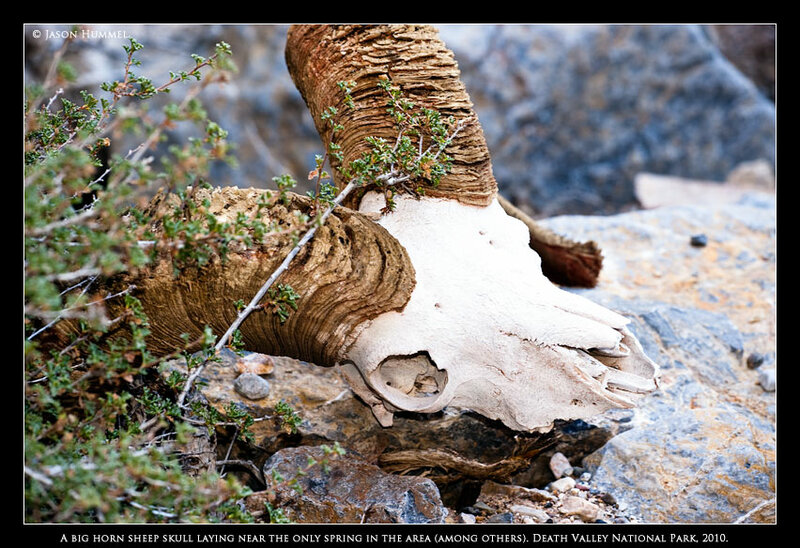 What I love about Death Valley had brought me here again, just as in 2009. 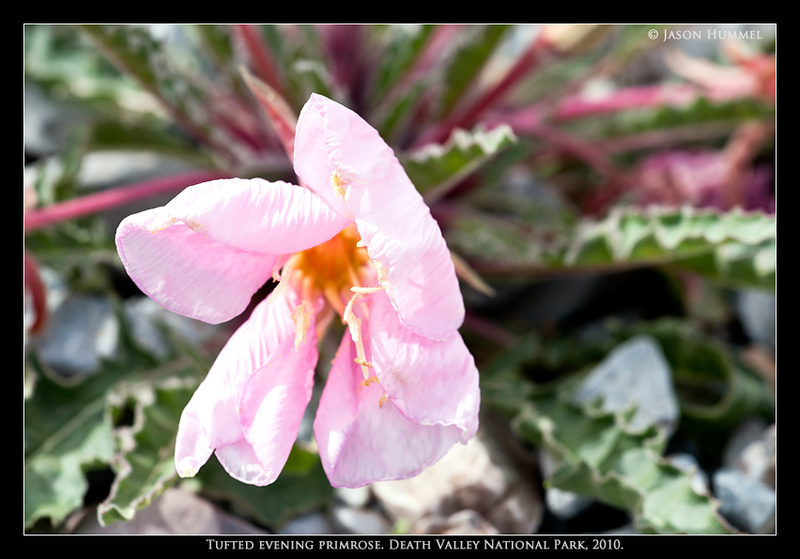 She wasn’t flamboyant like other national parks. For the most part, she is reserved. Yet I imagined in this arid and desolate landscape an entity that still held onto that air of royalty that all parks share; it is a treasured place. 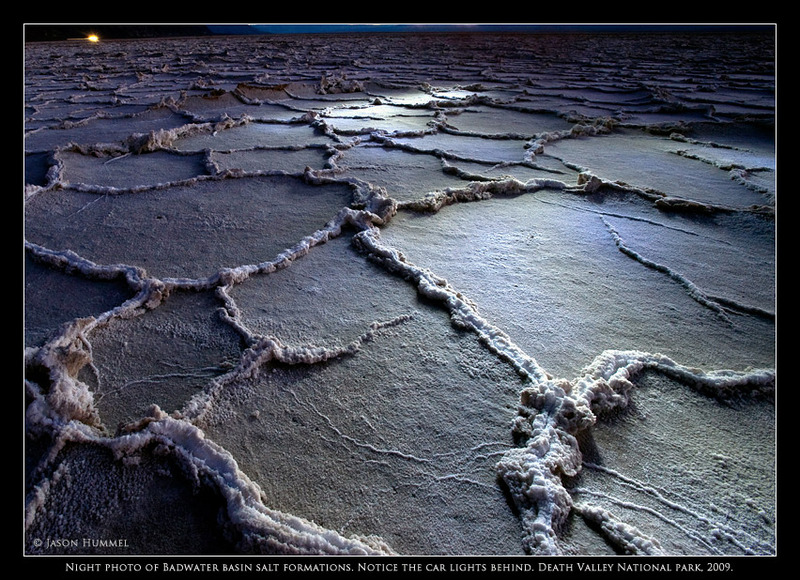 Take Badwater Basin for example, it is among the lowest points anywhere on Earth at -282 feet. And the mountains! Those can’t be ignored. They raise high above those seemingly endless salt flats. Yes, there are mountains here and not small ones either. 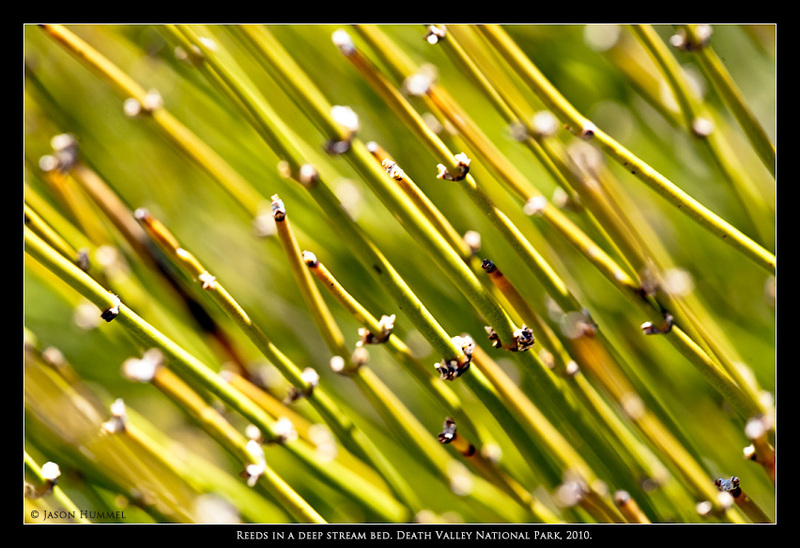 At 11,050 feet Telescope Peak stands the tallest with numerous others flanking the valleys. It is easy to feel enclosed. Gazing up, these looming goliaths certainly don’t speak, but in a sense, they don’t need to. Everything they have to say is written on their faces. Joining me on this southern road trip was my good friend Kathy. 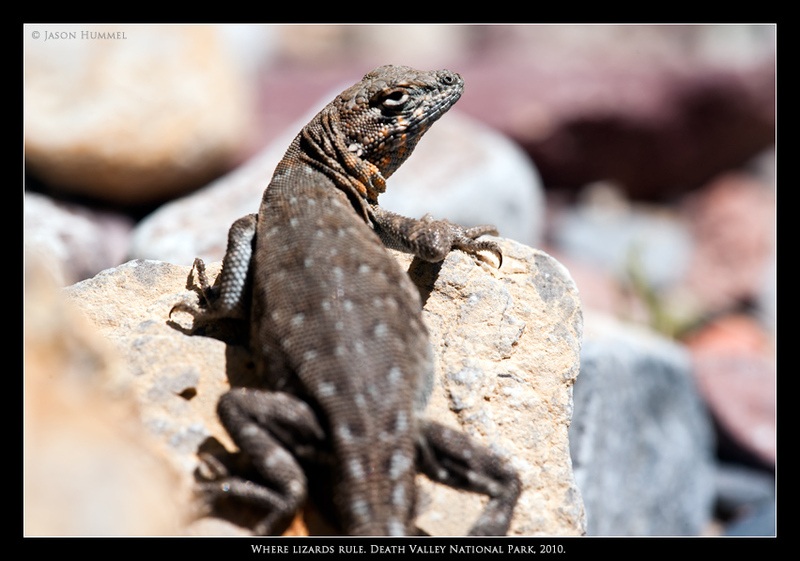 We’d met several years ago when she was looking for photos for a nature film she was producing. Along with her husband Robert, they spend much of their free time hiking pounds of equipment deep into the Cascade Mountains to film (see crestpictures.com for more about them). Like me, they need those escapes. Even right then, back in Death Valley stuck in a busy campground, Kathy and I knew we needed to get away from the hundreds of tourists and sightseers as soon as possible. By early morning that was a reality. We drove to the mouth of Titus Canyon, 2.6 miles up a dusty gravel road and parked. Next we pulled out our backpacks we’d fixed the night before and started off. 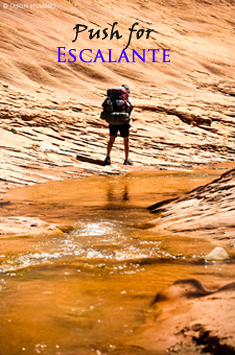 For the next 3 days we would leave the crowds and complete the Fall and Red Wall Canyon Loop. With the parking lot far behind us, as well as any crowds of people, we slipped in between those carved-out rock walls. Colored in shades of gray rock, these ominous cliffs climb thousands of feet toward Mount Palmer (7958 ft.). And ahead, stair-stepping rock and folds of slope in every direction carry an air of dominance. Even so, I find such a place attention-grabbing. Without wide views, your eyes are pulled down and centered on what lies in proximity to you and not far-off vistas. 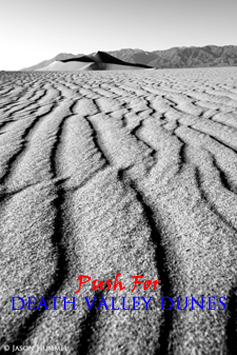 In such a way hours and miles pass as our shoes do over sand, time counted by each whooshing motion forward. 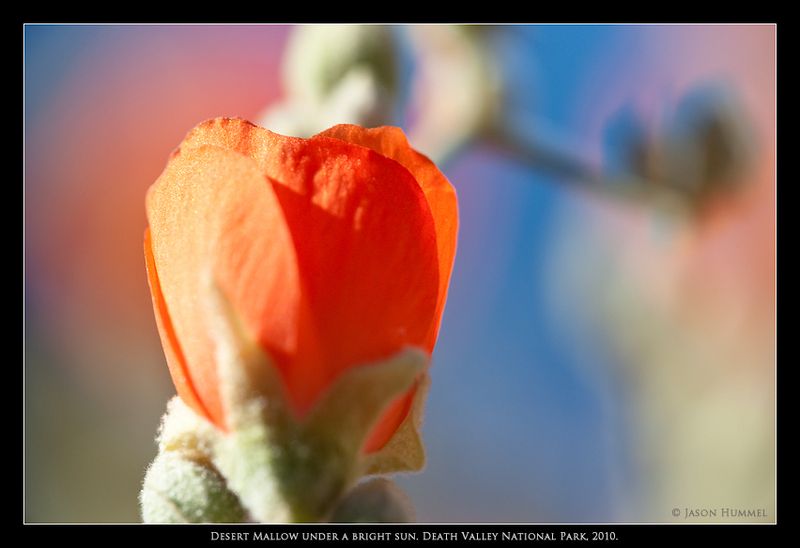 To either side and between were lizards, Death Valley sage, desert mallow and Mojave aster to keep our minds occupied. It wasn’t until evening shadows began to wash the walls that we had to pay more attention to what lay ahead. We had arrived at the 2nd of 3rd dry falls. Both must be climbed or by-passed. We chose to climb both drops since we had a rope. The first went easily on the left and the second was more challenging. 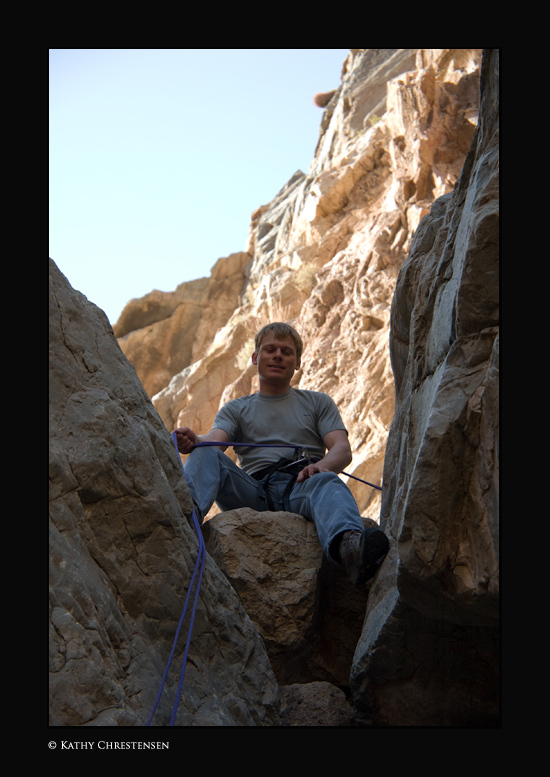 With a boulder jammed in a crack, I had to wrap my body around it to gain the top. For each I set a belay for Kathy once we hauled packs over. 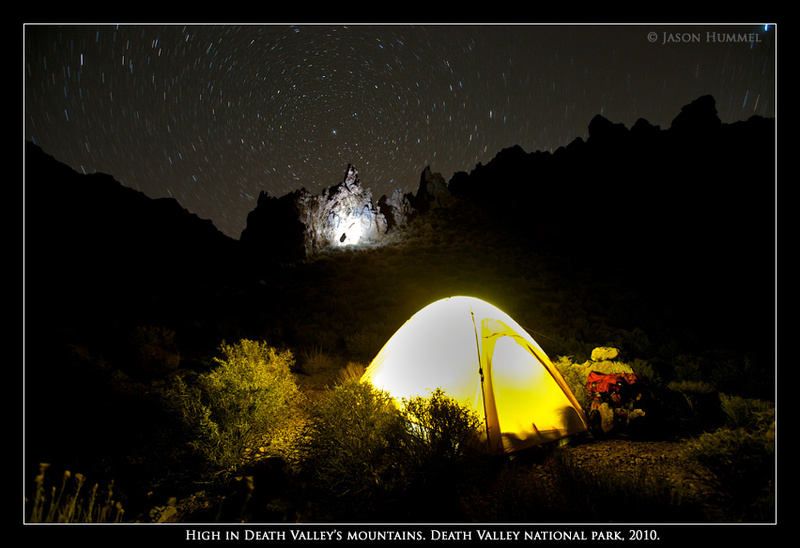 As we were in no particular hurry, we pitched our tent and watched wispy clouds cover stars while chilly air mixed with warm air before it all danced down the canyon. In the silence crickets could be heard chirping from every crevice. By morning we were reinvigorated. A clear sky now dominated as we arrived at a point where a spring resided, and where I thought we’d be able to climb over Mount Palmer. Under a boulder where green streaks of moss and algae were, a liquid soup resided in a narrow and dark cleft. Outside it were various bones of other creatures that didn’t find it soon enough or simply figured it was a good place to die. For me, it was an ill-omened space. 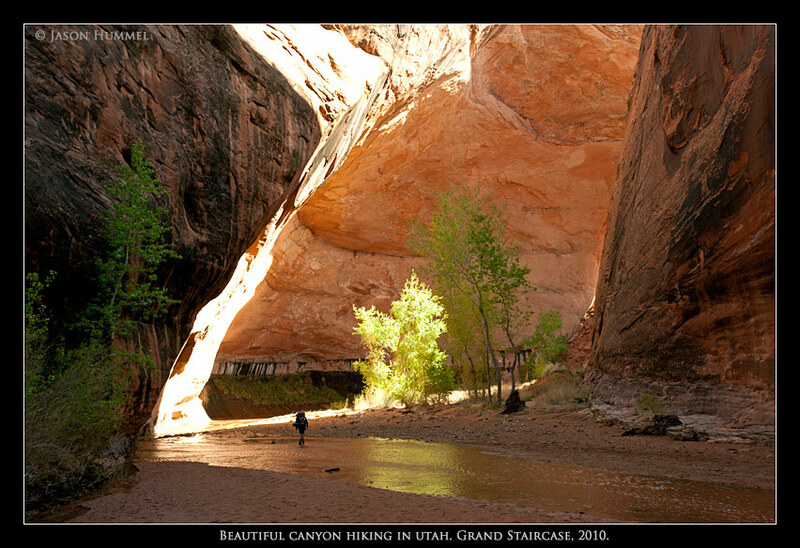 Once we had water, we continued up canyon until we were blocked by a dry fall too dangerous to climb. 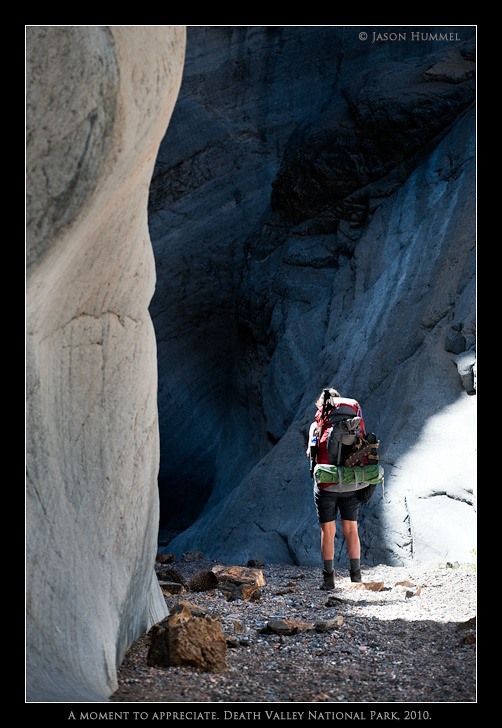 By then we realized our error and returned to Fall Canyon, which we continued up all the way to another large fall. It was just prior to here where we should’ve left the canyon, but we continued over on scary rock. 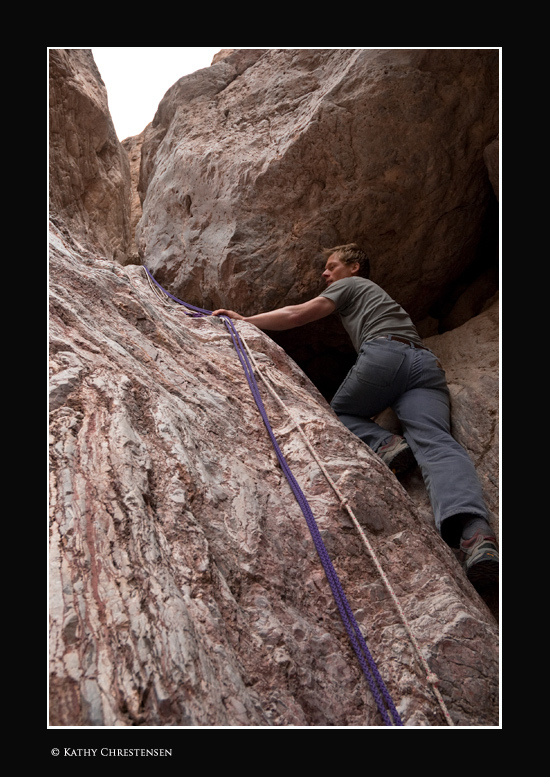 As soon as I recoiled the rope I’d set for Kathy, we exited the canyon. Now free with unrestricted views, we could make out Wahguyhe Peak (8628 ft.) behind us. Through various draws and ridges we traversed upward until we reached a 7200-ft pass which looked down another much larger wash. 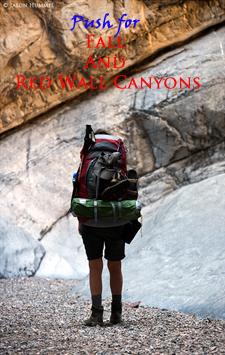 It would bring us to Red Wall Canyon. Before which, like a child, I found snow to make snowballs with. I couldn’t believe we’d found snow all the way down here! This just goes to show how diverse this fascinating ecosystem is. 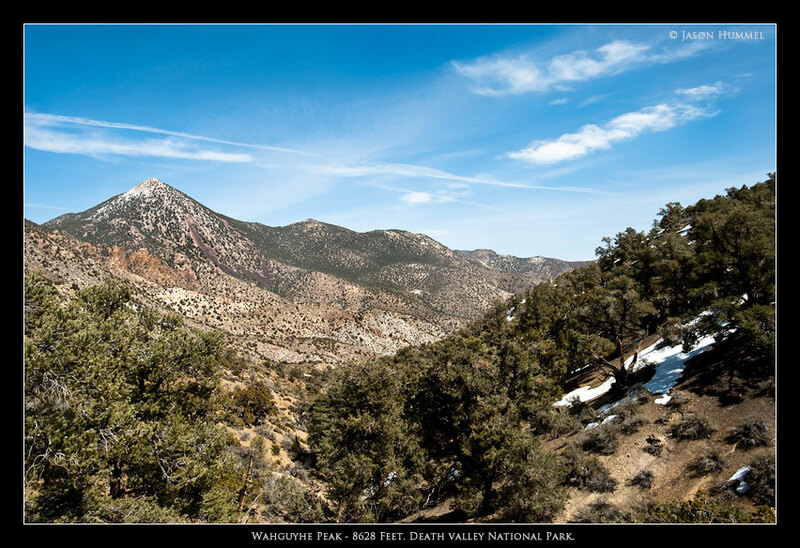 From dry desert sands full of low growing sage and flowers to high mountain slopes full of pinyon pines and juniper trees. 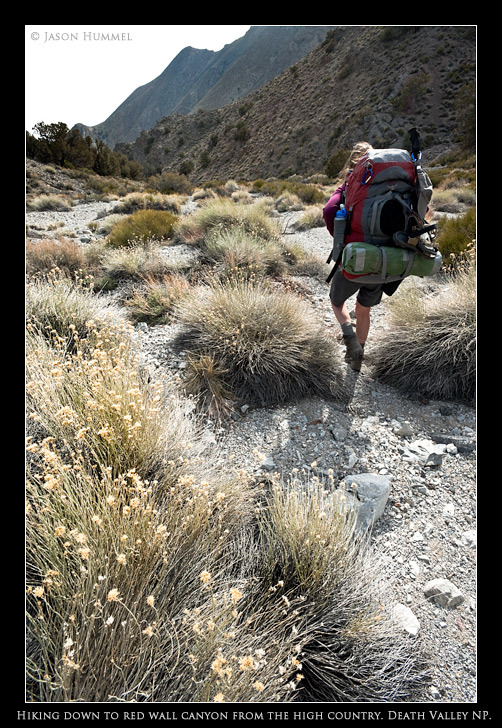 Loose dirt and rocks carried us downward and already the terrain was in metamorphosis. Trees disappeared within a thousand feet and the character of the area took on a more desert-like expression. 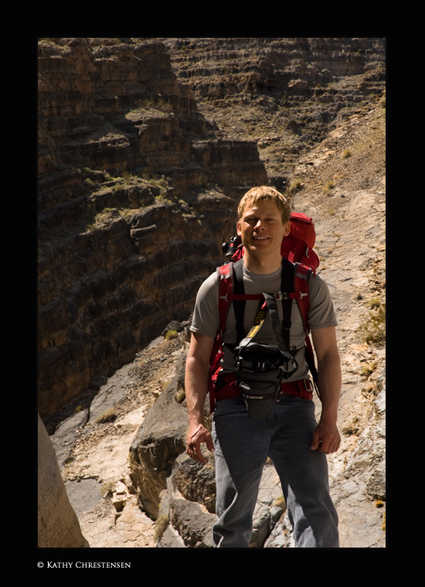 Near the confluence of Red Wall Canyon we decided to spend the night and save the rest of the hike for morning. By then, just as the night before, wind tears down the canyon like the waters it rarely sees. That night I rise under a banner of stars making up the Milky Way. My goal is for night photos of camp and the desert. Over the course of a few hours, I tried different exposures before attempting a longer one. It would turn out my battery would die just before it finished. 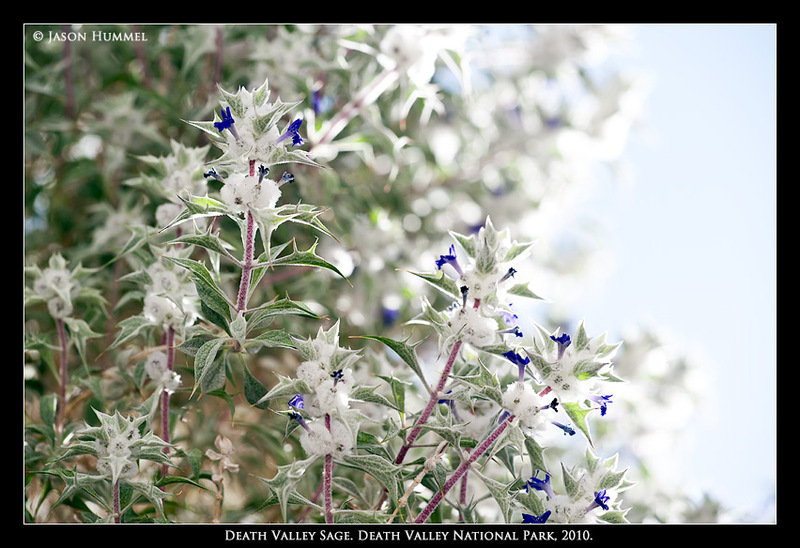 An hour sitting among the boulders and sage wasn’t soured, but my anticipation was. Even the owl I’d been listening to hooted his displeasure. I agreed with him. The morning of our 3rd day brought us awake. The wind was finally run off beyond our camp down onto the red walls that are presumably this canyon’s namesake. Hours later, I find the ambiance and air of these deep canyons reminding me of old forests. Like the trees, these rocks are so much older than I am and they will exist long after. Unlike previous days, this one flew by. 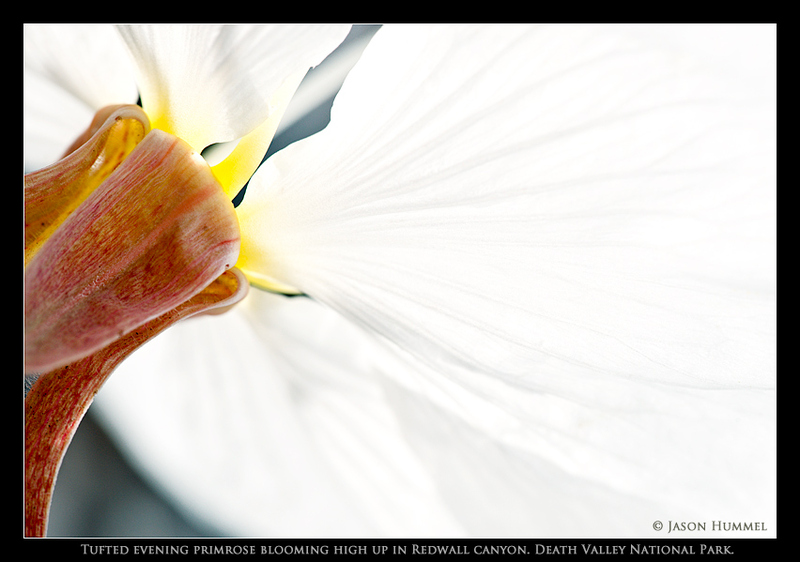 I found a solitary tufted evening primrose growing from the desert floor to be a surprising find and distraction. Not only were there no others anywhere in sight, but it was a fascinating and striking fragility in such a harsh environment. 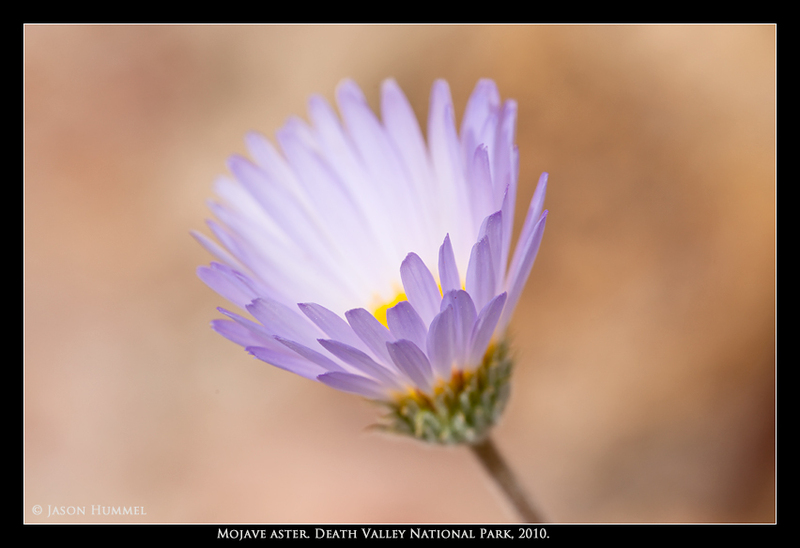 Where soft white petals spread out, I found out later in a book called ‘Mojave Desert Wildflowers’ that they only last a day before quickly wrinkling into a dark pink by the next morning. It was with sadness that we rappelled ourselves down the last fall and wondered out into the lower slopes beyond the mountains. Looking down over the amassed remains of all the rock that had been scoured from the canyons was a remarkable sight. Carved over the millennia by rain, those tentacles of debris line the valley bottoms. Called alluvial fans, these accumulations of rock and dried mud are fascinating features all their own. More convoluted and twisted than normally seen in nature, the slopes are uniquely formed. From the sides of the highways tourists spot them and photograph. 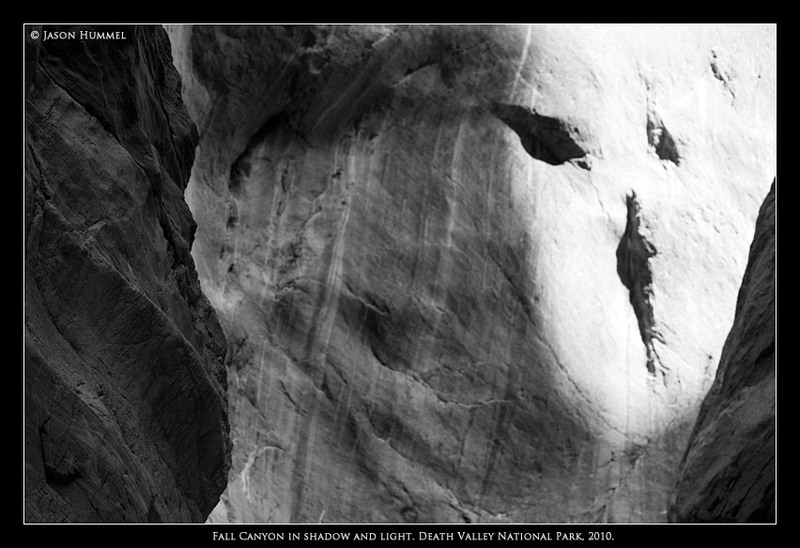 Some few even venture into the canyons from which they had come, but next to none enjoy what we had during the past three days. To me, anything good takes effort and anything great takes luck as well. Opportunity is always fleeting. It’s like catching a lizard. Even when you think you’ve captured it, their tails have evolved the ability to detach from their bodies so they can escape. While Kathy went to the highway, I stubbornly continued over those alluvial fans back to the car. To my left, between dark folds of ridge, other canyons snaked back toward the way we’d come. Looking into those mountains, I realized that they had spoken to me and what they had to say reverberated in the memories they had so freely been a part in creating (continue). More photos: see Alpine State OF Mind. Or CONTACT ME if you are interested in prints or licensing. If you enjoyed your visit, tell us about it on the GUESTBOOK.